COMTREND CORPORATION is a visionary company providing total solution services in the telecom and datacom fields. 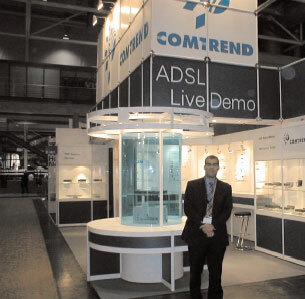 COMTREND designs, manufactures, and markets telecom and datacom equipment for both the CO and CPE side. COMTREND’s key products include: xDSL CPE, Wireless LAN, VoIP, IP DSLAM, VDSL Switch, WAN Access Router, CSU/DSU, Multiplexer, and Digital Cross-Connect System. COMTREND is built around a team of professional engineers dedicated to developing quality products, as well as providing innovative solutions. Nearly half of COMTREND's employees are design and development engineers, and 15% of revenue is targeted for reinvestment in R&D. This has enabled COMTREND to build competitive strengths in R&D, and technical support services; and allows the company to continually add new product features, and incorporate new communication standards into its products. COMTREND is an ISO-9001 certified company. COMTREND is an international company with global distribution. In addition to OEM manufacture, COMTREND markets its own brand through its offices in North America, Europe, China and Taiwan. COMTREND was established in 1990. COMTREND’s founders have considerable experience in the telecom/datacom field, including working experience with Bell Labs, and a Lucent joint venture. The original paid-in capital of US $230,000 has been increased to US $40million, in order to elevate COMTREND’s communication technology and capture emerging opportunities. The expansion of capital has been achieved without the need for venture capital, due to COMTREND’s ability to exponentially increase its revenue streams. Strong internal fundamentals have allowed COMTREND to remain debt free. COMTREND is committed to providing customers with the highest quality and best value products, through advanced engineering expertise. COMTREND’s success in attracting customers and maintaining customer loyalty has resulted in COMTREND’s explosive growth in revenue. The company’s greatest triumph has been its ability to attract, retain, and develop talented professionals from all around the world. COMTREND’s human resources have doubled over the last few years, enabling the company to manage the growing demand for its products, and position itself to take advantage of future opportunities. In addition to OEM manufacture for world-famous companies, COMTREND provides products under the “COMTREND” brand name for the global market. Through its international offices, COMTREND provides customers with instant and efficient solutions to guarantee customers the highest quality and service. To maintain its competitive advantage, COMTREND recognizes the need to continue developing its outstanding professional engineering and development team. Most engineers have a master’s or doctorate degree. COMTREND’s ability to recruit and develop a talented team enables COMTREND to provide its customers with advanced telecom/datacom products including: high performance integrated network equipment for carriers, and telecommunication solutions for enterprises. In order to provide high quality, cost-competitive products to customers, COMTREND executes strategies in manufacturing that are based not only on producing quality products, but also on flexibility to adjust to different scales of production. Through its long-term relationships with sub-contractors and material suppliers, COMTREND has established a flexible production environment. Therefore, COMTREND has the confidence to accept customer orders of any size and specification. Comtrend’s CT-535 Wireless ADSL Router won the “2004 Taiwan Symbol of Excellence Award” from the Ministry of Economic Affairs. Comtrend’s CT-535 is a Wi-Fi certified, fully integrated Wireless ADSL Router, integrating the 802.11b standard and built-in wireless technology with routing/bridge functions. Comtrend’s new product range will provide strong differentiating factors to the telecom players. Our new product portfolio of IADs and Gateways support triple play functionalities allowing simultaneously the transport of data, video and voices services on the operator network.COMTREND Corporation was the fourth largest supplier of DSL CPE in 2H-2002, according to a report released by Gartner Dataquest (March 2003). In the second half of 2002, COMTREND shipped over 1 million DSL units, and lifted their global share of the DSL market to 10.41%.Awarded all four tenders in year 2002 for providing 1,204,092 ADSL lines & 17,476 SHDSL lines of DSL Broadband Access Network equipment by Chunghwa Telecom, Taiwan’s largest telecommunication’s company. Market research indicates that Comtrend’s products have superior performance and reliability over previous suppliers. Comtrend Corporation international operations demonstrate the level of trust awarded to us. European Telecom operators and Internet Service providers are counting on us to support their ADSL deployment. Comtrend provides more than ADSL CPEs, our local teams have expertise in the marketing and logistics support of mass CPE and enterprise projects. All U.S. RBOCs have standardized on COMTREND-developed D4 Channel Banks. One of the RBOCs specifies COMTREND's products as the sole solution in case interoperability issues occur. Repeatedly selected by Hong Kong Telecom to supply fractional T1/E1 DSUs over other world-class companies. Developed one of the best performing ADSL Modems/Routers in the world. Independently measured data confirm the superiority of COMTREND's products over three other leading brands in the U.S. The MTBF (Mean Time Between Failure) for delivered Central Office circuit packs averages thousands of years, and for CPE averages hundreds of years. Once a customer, always a customer so far.